#NZvPAK 3rd T20I Toss PAK. Thank God not watching #PakvNZ T20I live due no cable. Guptil Pak bowlers kee full dhulai karty hui. 3rd T20I. 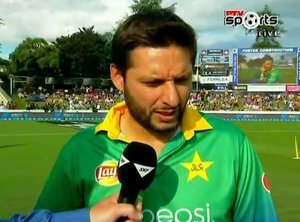 2.6: I Wasim to M Guptill, 4 runs, 40/0 bit.ly/nzvspak3 #NZvPak "
I bet @SAfridiOfficial ka NZ mien last intl match "Yaadgaar" rahe ga.
Yaadien achi hongi ya buri???? Cant predict????. "3rd T20I. 2.5: I Wasim to M Guptill, 4 runs, 36/0 bit.ly/nzvspak3 #NZvPak "